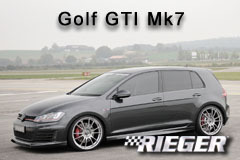 Smart tight design - world-class bodykit modifications by Rieger for the VW Golf 7 GTI. 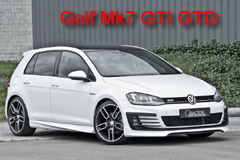 This is Volkswagen at the top of its game; The Golf 7 GTI excels in engineering, technology, and value. This GTI is 2014's "das Auto" for drivers - it holds all the credentials - the Golf 7 having been named "Car of the Year." Fresh off the lot and this machine is comfortable on the track. 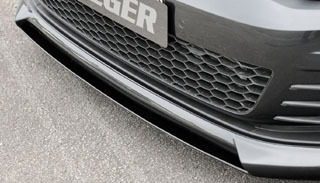 Now, Rieger Tuning (headquartered in Bavaria, Germany) offers a five-piece bodykit styling project that will make your GTI look like it was born on the track. Did you know that LLTeK has been importing Rieger Tuning body kits from Germany into North America since 1996? LLTeK will share knowledge and expertise by phone or e-mail and and make recommendations on the straightest line going into your Golf Mk7 tuning project. There are absolutely zero reasons for you to accept a facsimile. 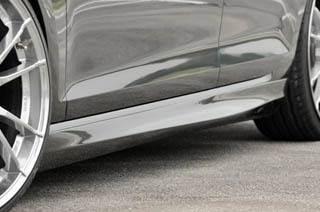 Your purchase of genuine Rieger designed and manufactured styling for the Mk7 assures trouble-free delivery and fitment. LLTeK ships to your door via UPS or FedEx in a carefully packed custom container. Off to the races - worry free. Call LLTeK toll-free in North America 1 888 465 5835 - Business Hours are 8:30 AM to 5:00 PM ET Monday through Friday (GMT -5). Outside North America LLTeK can reached via telephone at 001 514 733 6333 or e-mail via the link at the bottom of this page.